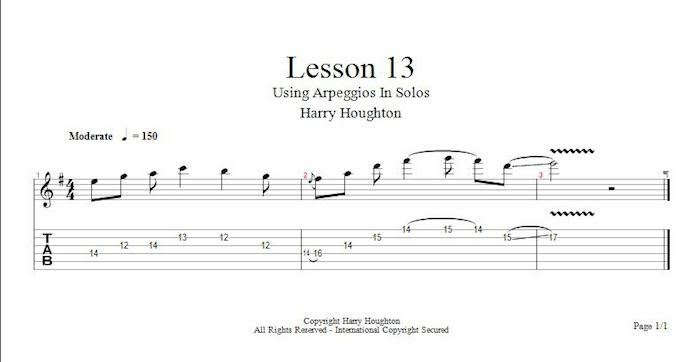 This month we will be looking at using arpeggios in your solos, specifically over a IV, V, I cadence in E natural minor (Am BM Em). We being with an Am9 arpeggio starting at the fourteenth fret of the D string using our third finger. We then pick the G and A notes at the twelfth and fourteenth frets of the G string using our third and first fingers, before playing the C and B notes at the thirteenth and twelfth frets of the B string using our second and first fingers. We then move up to our Bm arpeggio by sliding via a grace note from the E to the F# notes at the fourteenth and sixteenth frets of the D string. This is followed by the B note at the fourteenth fret of the G string using our third finger, then the D at the fifteenth fret of the B string with our first finger. We finish this lick by hammering on and off from the F# to G and back to the F# at the fourteenth and fifteenth frets of the high E string with our first and second fingers before sliding up from the D to the E at the fifteenth and seventeenth frets of the B string and adding vibrato.